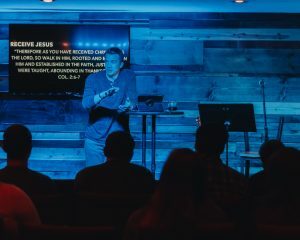 The College & 20’s Ministry of Waterloo Road Baptist Church is a place where you can breakaway from the mess of everyday life and get refreshed through worship, Bible study, and genuine fellowship. 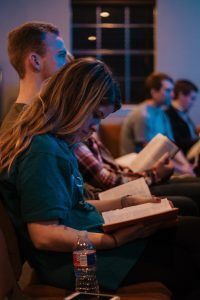 Sunday Small Groups: Every Sunday at 9:30 we enjoy a time of fellowship with each other over coffee and doughnuts and then we break open God’s word together and discuss together in student led table discussions what God is teaching us. This group meets every Sunday at 9:30 am in the Agape House Main Room. BREAKAWAY: The first Wednesday of each month during the semester at 7:00PM is a special night called BREAKAWAY. It is a relaxed, intimate time of worship, teaching, and free FOOD! Bible Study: The off weeks from Breakaway is in home Bible study and discussion led by students. This is a program where we pair college students with WRBC families. This is a great opportunity for students to become intertwined into WRBC. Families “adopt” college students and provide a few meals and maybe a nice quiet place to do homework or laundry. But more than that, you’ll develop a relationship where you’ll be discipled and loved. Click HERE to sign up! The first Wednesday of each month during the semester at 7:00PM is a special night called BREAKAWAY. It is a relaxed, intimate time of worship, teaching, and free FOOD!